La Cholita is one of my favorite inexpensive restaurants in Buenos Aires and I consider it a real find. I discovered this place in 2007. An Argentine friend with a big appetite for meat and not a lot of money in his wallet recommended it to me. I’ve been going back regularly ever since. There’s only one dish I order at La Cholita: la parillada completa. The menu says this dish serves two people, but I think four is more realistic. Maybe even six. The dish includes three types of sausages and all kinds of parts of the cow, most of which I have trouble identifying. Trust me, there is no way two people could possibly eat all this meat in one sitting. La Cholita isn’t fine dining, but the food tastes good and the restaurant is popular. The price is right too. I recently ordered la parillada completa for two people and paid 48 pesos, including a side of fries. One year ago this same dish cost just 30 pesos. That should give you some idea of how high the inflation rate is in Argentina. La Cholita is located at Rodriguez Pena 1165, just north of Santa Fe. The phone is 4815-4506.
wow, your feast looks awesome. one of the reason i’m thinking of heading to BA to study spanish is because i hear the steak there is awesome. can you give me some idea how much a decent steak at a restaurant will cost? how about wine? coffee? i’m trying to get an idea how much food will set me back down there? 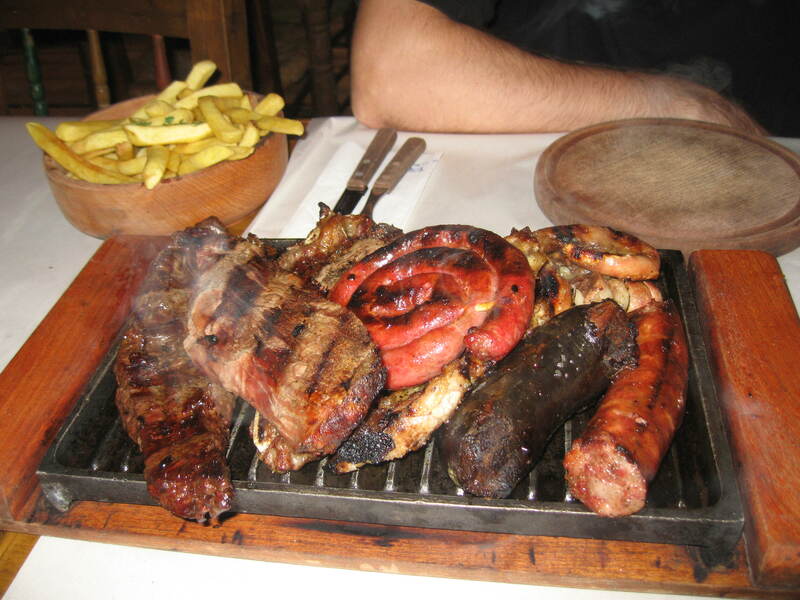 If you like meat, you’ll love it in BA. A typical steak at an average corner restaurant in Palermo or Microcentro will cost about 25 pesos, including fries or mashed potatoes. A typical breakfast of cafe con leche, toast with jam or cheese, and a small fresh-squeezed orange juice costs about 10 or 12 pesos. At the time of this writing one USD is worth about 3.4 pesos. One Euro is worth about 4.8 pesos. The inflation rate in Argentina is high, though. The unofficial inflation rate is about 25% so prices are rising quickly. But overall, restaurants in BA are still cheaper than in major cities in USA or Europe. La cholita is a great place to go!! !